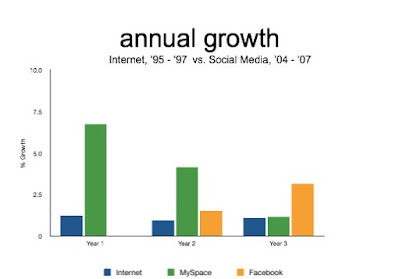 The following chart compares the adoption rates of the internet from 1995 - 97 versus the recent rise of MySpace and Facebook. The starting point for both was around 2 million users. Social media is bringing upon the constituency a rapid evolution. Understanding of where it is heading and what it means is lagging. Few understand the opportunity, let alone the consequences. And even fewer of those folks are in decision-making roles, whether it be government, corporate or otherwise. Issues such as this are going to bubble up fast and furious over the next few months and years. Societal change is so fun to watch!